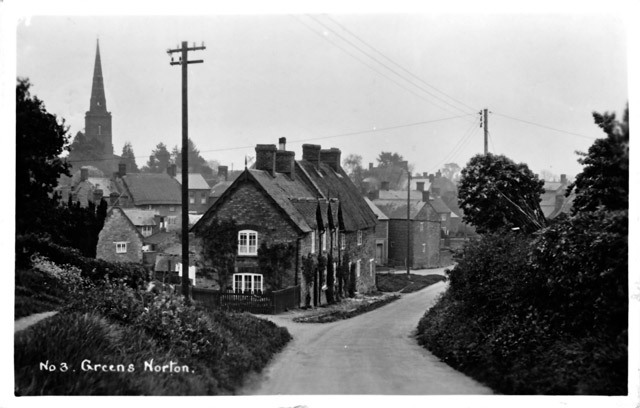 This postcard was postmarked Kettering (Northamptonshire) August 1906. It was addressed to R G [Reginald George] Lewis Esq, 19 The Avenue, Rothwell. The sender is seeking the return of his bicycle lamp if Reginald borrowed it from him. Reginald George Lewis (born 1891) was the son of George and Ada Lewis nee Roughton. The photograph was taken from the corner of the High Street and Bradden Road, looking north towards the Butcher’s Arms. Thank you Mary Taylor for identifing this location. 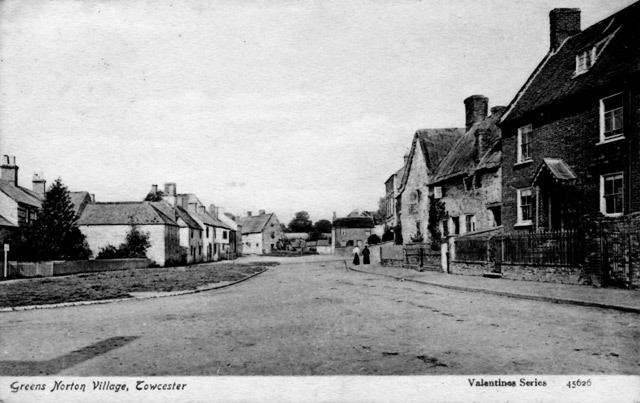 This postcard was postmarked Towcester and dated by the sender as 5 September 1938. It was addressed to Emmy (Emmi) Bogsch of Andrássy Avenue Budapest Hungary. The photograph was taken in Blakesley Hill just west of its intersection with New Road. The church spire belongs to the Parish Church of St Bartholomew. 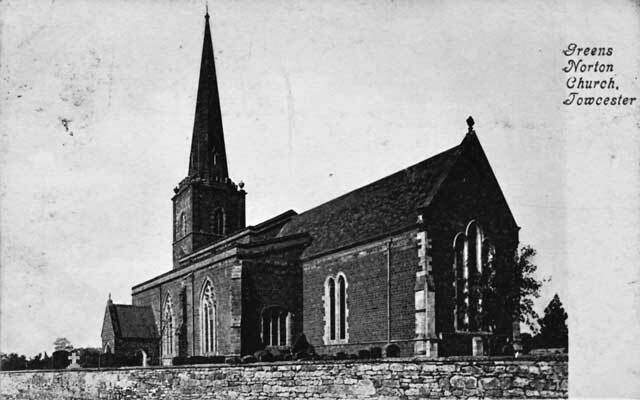 Valentine Series Card showing the Parish Church of St Bartholomew with a glimpse of some graves. It was sent by Alice c/o Mrs Hefford of Brooklands, Greens Norton to Mrs L Morgan of Kitto Road, St Bartholomew's Park, New Cross. Posted with a King George V half penny stamp affixed to it. Richard, the sender of this card has dated it 22 August 1982 and posted it from Kings Cliffe to his parents, Mr and Mrs S R Walker in Hollie Lucas Road in Birmingham. 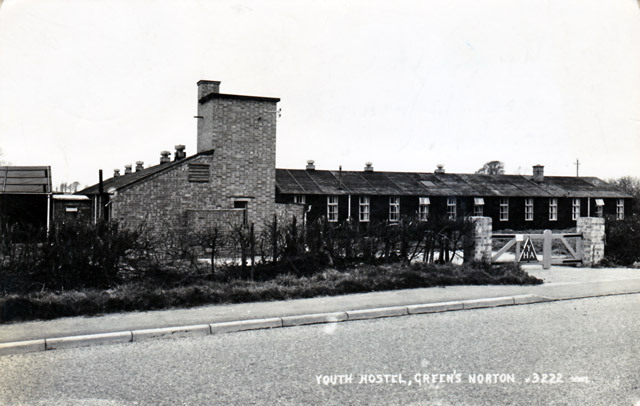 This Youth Hostels Association hostel was in Towcester Road (opposite the Calvert Road intersection) and operated from 1952 to 1983. The building is said to have been built for the Land Army early in World War II and later used as a Prisoner of War (POW) camp before becoming a YHA hostel in 1954. It was partly demolished in 1984 but the tower still stands with the YHA logo on it. The Community Centre is on land formerly occupied by the hostel. View along part of Watling Street in Towcester. Businesses on the left include an India & China Tea merchant and a cafe. 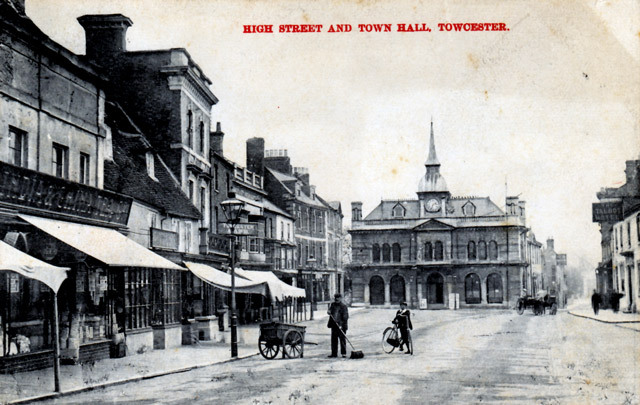 In the centre is the Towcester Town Hall and Corn Exchange and on the right the Talbot Hotel. The Talbot Hotel ceased trading in about 1960. Card sent by George to his Auntie Em, Mrs Kilby (?) , 41 Chenies Rickmansworth Hertfordshire.